Another year, another cheese and I'm starting off in my home state and revisiting Yarra Valley Dairy - head to this post for further information on the Dairy. 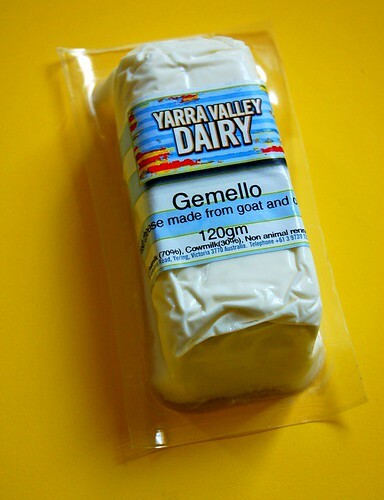 Yarra Valley Dairy Gemello is a fresh cheese made in traditional farmhouse style. It's unusual in that it's a blend of Goat (30%) and Cows (70%) milk. 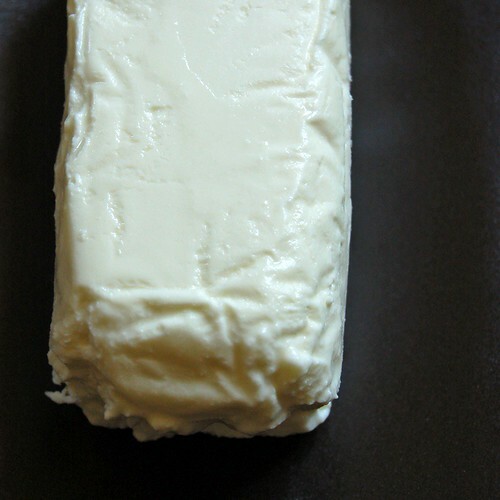 The result is a extremely white cheese that is semi soft. If you are careful you should be able to slice the cheese but it's more suited to being broken into odd sized chunks that are just great for salads. You could also use this as a spread. Tastewise, the goat imparts a subtle sharpness, a perfect foil to the creamy characters of the cows milk. I would class this as a great cheese to give to those that are new to goat cheese or are just looking for something a little subtle and mellow. I am so pleased to see that this wonderful cheese is made with non-animal rennet. Because of this I am able to go to really nice restaurant in Richmond which uses this particular cheese and know that I can have a vegetarian meal without any worries. thank you for being so considerate!